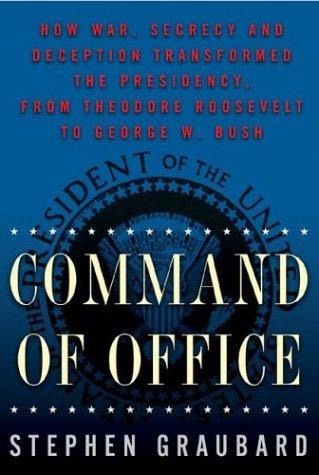 Stephen Graubard’s Command of Office is a monumental and challenging analysis of what has come to encompass the contemporary U.S. presidency. The Brooklyn Rail recently caught up with Graubard to discuss with him the historical impact of the presidency on this hour in America. John Reed (Rail): Has the U.S. presidency had a consistent reaction to disasters and human suffering around the world? What are the variables that come into play when presidents are looking at their involvement in crises abroad? Stephen Graubard: I am not sure that I know what disasters and human suffering can be said to encompass. I would point out, however, that Theodore Roosevelt was very proud of his efforts to help persecuted minorities in Europe, that FDR literally “saved” Britain by what he did in 1940 and 1941 before Pearl Harbor, not only by pressing Congress but also by his executive orders. He helped in all sorts of ways to alert the country to the dangers of Nazism and therefore kept British resistance alive. He knew something of what Hitler was doing to the Jews, but never all that came to be revealed about the Holocaust. In any case, he did not see what he could do to help the endangered Jews, never taking in the full character of the catastrophe represented by Auschwitz and the other death camps. Harry Truman, by his Marshall Plan, but also by his help to Greece and Turkey and Point Four program, did much to reduce human suffering in the devastated societies that had experienced World War II. John Kennedy imagined that he was helping to liberate Cubans from their oppressors by his Bay of Pigs, a tragic mistake. Richard Nixon withdrew many of the American forces from Vietnam but believed he could not cut and run, that to do so would only increase suffering in the whole of Southeast Asia. Jimmy Carter sought to rescue hostages taken in the invasion of the American embassy in Tehran and failed entirely to do so. Ronald Reagan imagined that the policies advanced by his aides, represented by the unforgettable word “Irangate,” would liberate hostages and at the same time offer aid to “freedom fighters” in America. The plot, when revealed, was only embarrassing to him. Clinton took few risks, though he imagined that he had helped rid Serbia of its oppressor, as George W. Bush also imagined when he toppled Saddam Hussein and rid Afghanistan of the Taliban. Of yesterday’s inaugural speech by Bush II, one can only echo Robin Cook’s words, as given in The Guardian this morning. Cook, once Blair’s foreign secretary, writes: “The Bush administration is in denial about its disastrous failure in Iraq.” His article is entitled “Fireworks in Washington, Despair Around the World.” Presidents generally try to engage themselves when they think they can win popular and world support by doing so. At times, they make grievous mistakes in respect to both. Rail: At the moment, there’s some idea that the U.S. election process has become exceptionally vulnerable to tampering, even that elections might be or might have been stolen. What’s the historical precedent in this century? Graubard: Nixon, defeated by Kennedy in 1960, believed he had been cheated by “boss” chicanery in Illinois and Texas. Eisenhower urged him not to contest the election. Bush II, elected by the grace of the Supreme Court, almost certainly won by tampering in Florida, but Gore thought better than to continue the fight. In short, there have been contested elections in this century, but not that many. Rail: The 19th century saw a good deal of political graft. In whose administrations, in what areas, would we look for that kind of corruption in the 20th century? Graubard: Corruption was common in the 19th century. It was less common in the 20h, though it reached a very high level in the time of Harding, in the revelations that followed his death. He may not have been himself personally involved, but some in his cabinet were, and others made his administration seem a time of theft. “Teapot Dome” is the best shorthand for 20th century political graft, represented by illegal concessions given to some, including many in high places. The theme of political corruption, though spoken of frequently, not least in the time of Truman, has been partisan political propaganda more often than is sometimes acknowledged. It is not America’s chief political problem, though those who support presidents financially are often the beneficiaries of their largesse. In an age when television costs are so high and it is so important politically to use that medium, money counts as never before. Rail: Is there a uniformity to the background of U.S. presidents and their administrations? Is there, as is commonly assumed, a political royalty in the United States? And, if so, has there always been one? Graubard: Is there uniformity to the background of U.S. presidents and their administrations? Yes and no. All have been men, and none has been black. Yet the administrations are very different in their professional composition and in their ideologies. Henry James spoke of “Theodore Rex,” an elected king, a monarch of sorts. Theodore Roosevelt knew the situation but acknowledged that it was important not to emphasize it. He knew how great was his constitutional authority and how he could use it in foreign affairs, a presidential reserve in many ways. Wilson learned from him and was also a “king” of sorts, with a very major courtier, Colonel House. He was a great war president, aspired to be a peacemaker, and failed in that. Men (and women) sought to be close to FDR, a true monarch, again with many courtiers, and we know that the Kennedy court, the court at Camelot, was a reality, made so not only by the journalists who celebrated its qualities. Reagan was a monarch who hid his royalty, pretending to be just a “good Joe.” As for George II, the British and many others are writing today about his “coronation.” Neither of his daughters is dubbed a “princess” in the manner of Alice, Theodore Roosevelt’s daughter, but this is a “royal” family, thought to be remarkable by some, ludicrous by others. The important thing is that George W. controls the foreign policy of the United States, and neither the Senate nor the media is able to limit his authority in that critical sphere. Rail: Has the influence of religion on the presidency evolved over the century? What kind of influence has religion had on policy shaped by the presidents you examine? Graubard: Religion has always been important in the United States. Until John F. Kennedy won the primary in West Virginia, no one believed that a Roman Catholic could win the presidency. The sad fate of Al Smith in 1928 seemed to suggest that the presidency was a “Protestant preserve.” Presidents have always in this century been proud of what has been called America’s “civil religion”—its belief in the unique character of the American people and its democratic institutions, blessed by God, America’s protector in time of war and peace. Catholics, until recently, were deemed dangerous, and not only by the Ku Klux Klan and others like them. Today, great numbers of fundamentalist Christians deem dangerous and immoral all who do not believe in religion as they do. On all manner of issues—federal support of religious schools, gay marriages, abortion, and the like—religion counts. The hostility to the Soviet Union was based in part on hostility to a godless world, and not only by the Hearst press. In short, presidents have to pay attention to religious belief in what they do with respect to both domestic and foreign policy. Rail: What are your predictions concerning the continuing evolution of the presidency? What about independent candidates?